Miguel Aguirre Morales is the recipient of Scholarship America’s 2018 Dream award for the 2018-19 school year. 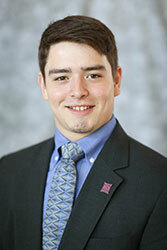 Aguirre-Morales was awarded an $8,000 scholarship by Scholarship America. Given to 12 students nationally, the 2018 Dream Award rewards those who have overcome barriers and have successfully started their collegiate careers. A biology major with a double minor in chemistry and mathematics, Aguirre-Morales will be interning this summer with the Smithsonian Environmental Research Center, based in Edgewater, MD. While there, he will be working in marine labs. The junior has been busy since his arrival to campus, serving internships at the Santa Ana National Wildlife Refuge in Texas, and with the Doris Duke Conservation Scholarship Program at the University of California-Santa Cruz during the summer of 2016. In 2017, he interned with Conservation Metrics in Santa Cruz, CA, an organization that automates wildlife survey efforts through technology, statistical rigor, and extensive scientific expertise. Aguirre-Morales is also involved with the Wabash Liberal Arts Immersion Program, which aims to improve graduation rates of first-generation and traditionally under-represented populations by immersing students in an engaging and supportive environment to open a wide-ranging path of educational and career opportunities. A member of Delta Tau Delta, Aguirre-Morales is president of the Wabash Marine Life Club and a past secretary of the Environmental Concerns Committee.